The establishment of indoor plumbing has made it easier for people to drink, cook, and bathe, and the availability water taps made it even more convenient. If you are thinking of changing the look of your kitchen or bathroom, getting new taps is a good start. Most water taps function the same way, regardless of the material used. Plastic taps are great for kitchens and bathrooms. They are made of durable materials and are quite affordable. You can get a quality plastic water tap for less than $20 and because they’re plastic, they come in cool and attractive colors. Compared to brass, copper, or chrome, the plastic water tap looks more modern and fresh. Compression tap—This is the oldest type of water tap. It has a rubber washer that is often the cause of repair and maintenance. It has separate handles for hot and cold water. Ball taps—This is the first of the washer-less kind. There is a rotating ball that serves to align the hot and cold inlets within the body of the tap. This is ideal for kitchen use. Disc taps—This is a newer type of water tap. The one-handled tap has three different seals to handle hot water, cold water, and a mixture of hot and cold. The two-handled tap only has one seal that controls hot and cold mixture. 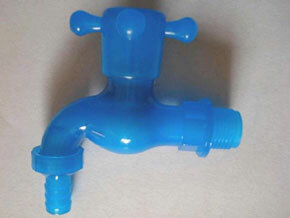 Cartridge tap—This tap has a movable cartridge that goes up and down to regulate water flow. The temperature of the water can be adjusted independently by moving the handles. There are several considerations in choosing the right water tap for your home. First is to consider where it will be used. Will it be placed in the kitchen or the bathroom? Then, you have to choose the material; there is brass, metal, or plastic water tap. Next, you have to decide on the type of water tap to buy. Will it be a cartridge, compression, disc tap, or ball type? Style is also another consideration. Will you get the one with a pullout spray head? This style is perfect for washing food and vegetables particularly if you have two sinks placed side by side. A plastic water tap is very popular for kitchens and bathrooms, and because they are made of polyethylene or polypropylene, these taps are less costly. Plus, it won’t rust or corrode, unlike metal taps that easily do. Using a plastic faucet will not change the taste of your water, nor will it affect safety, and should your water tap get damaged, you can easily replace it because you can install the water tap by yourself. There are so many water taps in the market nowadays and a visit to your local home improvement store will only confuse you. You will see a wide array of taps of different styles, colors, and materials so if you want to have a much better time shopping, you should consider ordering these things online.